Another small expansion to my collection of signed Gene Wolfe firsts, and another Wolfe title from specialty publisher Ziesing Brothers. A long time ago, I picked up a signed The Castle of the Otter (not one of the 100 signed limited editions, but one of the 420 blue cloth bound regular editions that had been subsequently inscribed and signed..) which (as I understand it..) was Ziesing’s first real book publication. I also have Free Live Free, which was Mark V. Ziesing’s (as they were now known) fourth book and Wolfe’s last with them. The book we’re concerned with here was their second. So, the brief history of Gene Wolfe as related to Ziesing publishers has been covered, let’s take a look at this lovely book. Click the images for a larger view. This copy is almost perfect. It’s a solid Fine if not Mint. 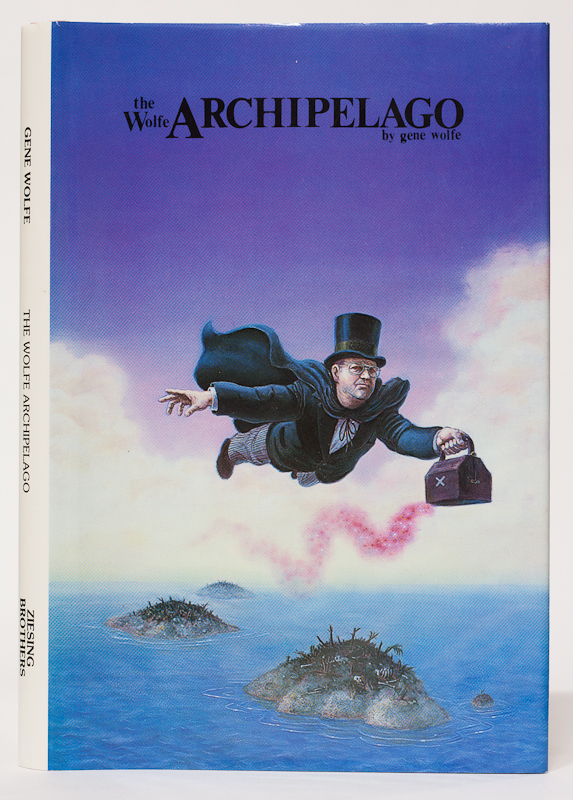 That’s Mr Wolfe himself flying across the cover, by the way… Presumably that’s his archipelago below. As issued with the DeMarco bookplate laid in. I specifically asked about this before I made the purchase. 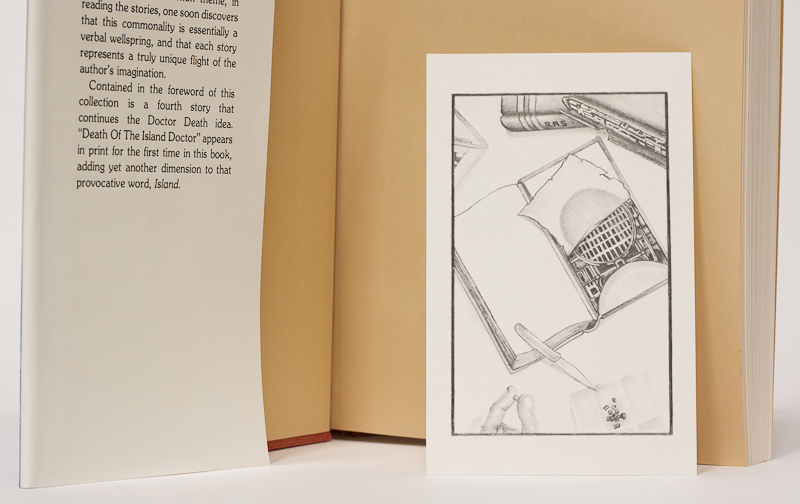 There was another copy I inquired about that did not retain the bookplate, and they were asking $80. This is why resources like Currey and (in this case) Chalker & Owings are so valuable to collectors. They tell you about these little details that are so important to the value of a book. Do your research before buying collectable books! A slightly unusual detail in this book is that the signature page is tipped in at the back of the book, not at the front as seems to be usual. 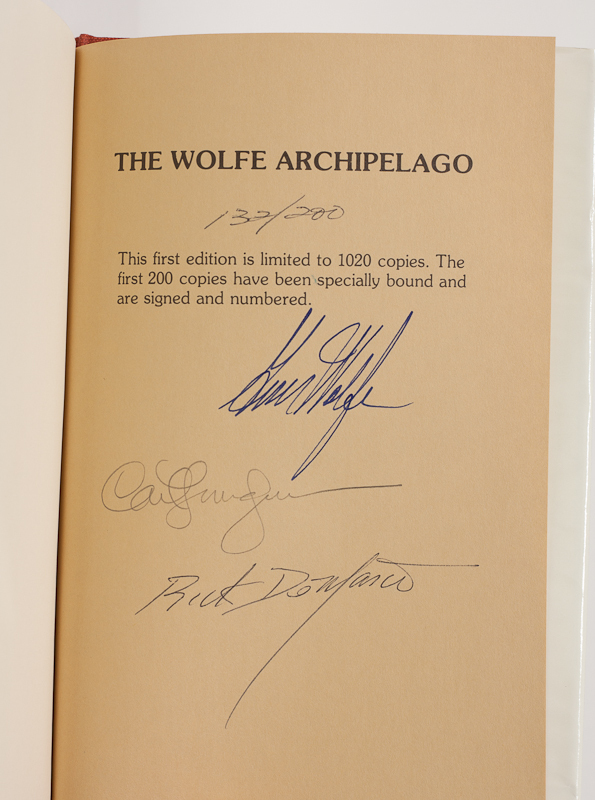 Signed by Gene Wolfe, Carl Lundgren and Rick DeMarco. As you can see, this is one of the exclusive 200. 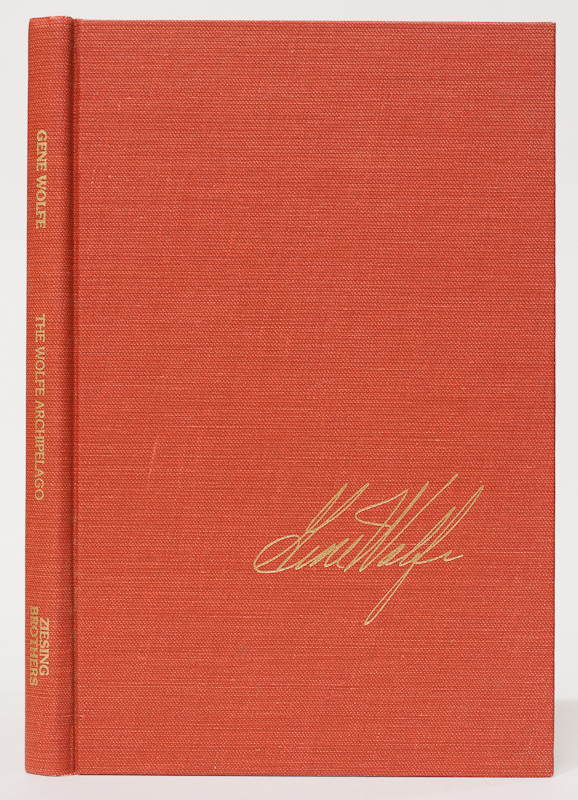 Binding: Orange cloth with gold lettering on the spine and Mr. Wolfe’s signature in gold on the front. Currey: Absent. I think because this was published after Currey was compiled. Comments: Not much to add. A beautiful copy. Ah, the back of the jacket is blank – just solid white, which is why I didn’t feature it here. This entry was posted on May 15, 2012 at 5:18 am and is filed under Close Up, Gene Wolfe with tags Carl Lundgren, Gene Wolfe, Rick DeMarco, The Wolfe Archipelago. You can follow any responses to this entry through the RSS 2.0 feed. You can leave a response, or trackback from your own site.